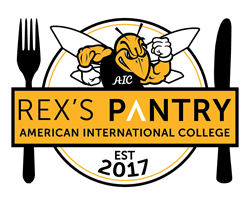 American International College (AIC) is launching Rex’s Pantry, a food and necessities pantry housed on the AIC campus to assist community members in need. We cannot forget those who are homeless or who struggle with food insecurity on a daily basis. Rex’s Pantry is an opportunity for us to do more to help those in need of assistance. During the season of giving, American International College (AIC) is launching Rex’s Pantry, a food and necessities pantry housed on the AIC campus to assist community members in need. Rex, a yellow jacket, is the AIC mascot. On Friday, December 22, 2017, the inaugural deliveries will take place with 100 Rex to the Rescue kits distributed to Friends of the Homeless, a local nonprofit organization that provides emergency shelter to nearly 1,000 men and women each year as part of its services. The kits will contain an assortment of hats, socks, gloves, foot- and hand-warmers. In addition, AIC personnel will deliver 100 kits containing boxed lunches, bottled water, snacks, and non-perishable items to the Springfield Rescue Mission, a Christian organization whose purpose is to meet the physical and spiritual needs of the hungry, homeless, addicted, and poor. “This time of year is celebratory for many, but we cannot forget those who are homeless or who struggle with food insecurity on a daily basis. While American International College reaches out to the community in many ways throughout the year, Rex’s Pantry is an opportunity for us to do more to help those in need of assistance,” says Associate Vice President for Auxiliary Services Jeffrey Bednarz. Also on Friday, AIC staff members will be stopping by Springfield Fire Department Station 8 and the Springfield Police Department with trays of lasagna in gratitude for first responders’ dedicated service to the College. The Rex to the Rescue kits are a collaborative effort at AIC. Food is being prepared by Chartwells Dining Services for Higher Education, a division of Compass–USA Foodservice. C&W Services and G4S, in charge of facilities and campus security respectively at the College, are donating hats, socks, gloves, and warmers. The AIC Campus Bookstore is providing back packs to hold the contents of the Rex to the Rescue kits. Founded in 1885, American International College (AIC) is a private, co-educational, doctoral institution located in Springfield, Massachusetts. AIC is an interfaith, interracial, and international educational institution comprising the School of Business, Arts and Sciences, the School of Education, and the School of Health Sciences. AIC supports and advances education, diversity, and opportunity for its students and the community.